You are here: My-Peer Toolkit » Planning » What are peer-based programs? 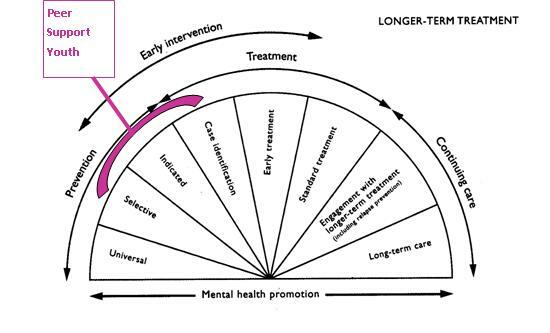 Peer-based interventions are characterised by a complex and highly variable application of approaches, definitions and interpretations, often summarised under the umbrella term of ‘peer education’. The diversity of utilised strategies targeting a multitude of population groups aimed at the achievement of differing goals and objectives make it difficult to assess and review the field of peer-facilitated programs. In addition, many different types of peer-based programs exist including community and school-based programs, informal drop-in centres, structured peer support programs, weekend camps, peer education/-leadership programs, mentoring programs and online support services. Peer-based programs are further characterised by the utilisation of an approach that actively involves young people in all stages of a program including participation in program design, delivery and evaluation. Read about the different types of peer-based programs. Read about a framework for defining peer-based programs in mental health promotion. Brown, G, Lobo, R, Maycock, B & Burns, S 2007a, ‘A framework for defining the role peer-based approaches in mental health promotion’, International Journal of Mental Health Promotion, vol. 9, no. 3, pp. 29-37. Commonwealth Department of Health and Aged Care 2000, National Action Plan for Promotion, Prevention and Early Intervention for Mental Health, Mental Health and Special Programs Branch, Commonwealth Department of Health and Aged Care, Canberra.